3.Options for how you want the Snipping Tool to behave. 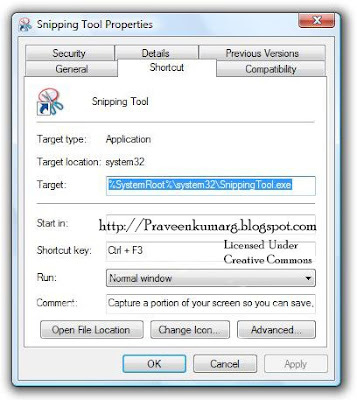 The Snipping Tool window itself will be invisible in any screen captures you take with it. 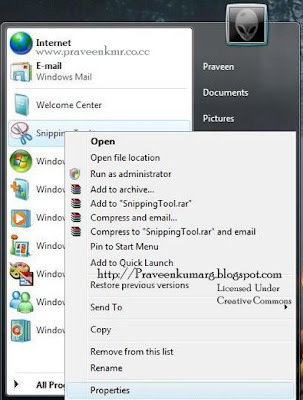 1.Click Start Menu–> All Programs. 2.Click the Accessories folder, and you’ll see the Snipping Tool. 3.Right click it and go to the Properties screen. 4.Assign a hotkey according to your convenience.Here I have here assigned Ctrl + F3 for fast Operation. I hope this Vista Hack will be useful for you.